Between 1330 and 1332, the Buddhist priest Kenko, having as he put it “nothing better to do” turned to his inkstone and brushes. He jotted down his thoughts, observations, and opinions; anecdotes that he found interesting, amusing, or instructive; accounts of customs and ceremonies—everything that seemed to him worthy of preservation. 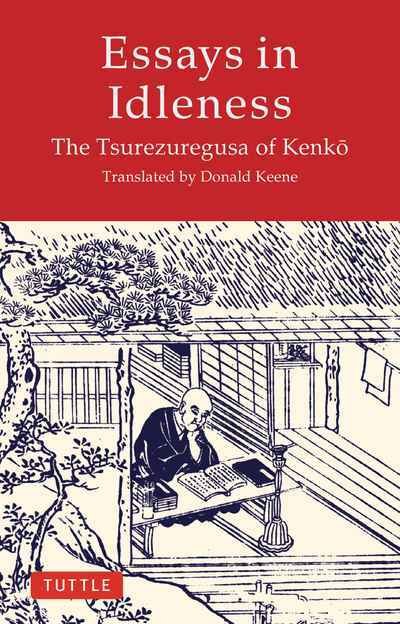 Donald Keene’s complete translation admirably presents this extraordinarily influential Japanese classic. The little essays—none of them more than a few pages in length, and some consisting of but two or three sentences—give us the self-portrait of a most engaging gentleman. He loves the past: every scrap of tradition is precious to him. He is haunted by transience, by the vanity of human desires and ambitious, by the inevitable approach of death. He values modesty and simplicity, even as he appreciates subtlety and formality. Sometimes he contradicts himself, as a journal keeper may so easily do, but these lapses are in themselves endearing. However Kenko is consistent in his statement of the peculiarly Japanese aesthetic principle: beauty is intrinsically bound to its perishability. The imperfect, the irregular, the understated, beginnings and endings—these have a charm of their own which surpasses that of completion.